Coin Rivet is a global publishing brand going places. Officially launched in the summer of 2018, we’ve been involved from the start helping them to create and develop their brand. 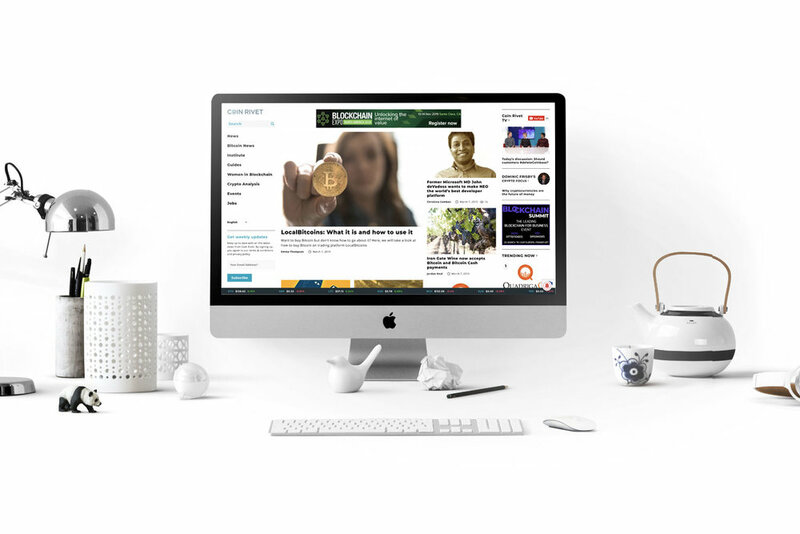 Coin Rivet operates in the blockchain and cryptocurrency space, providing news, analysis, how-to guides and interviewing some of the industry’s key influencers. 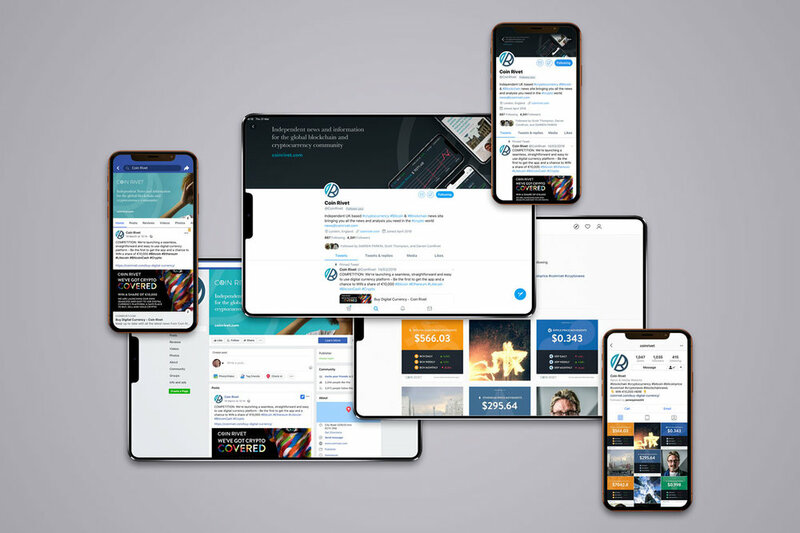 From a standing start, the brand, website and social media audience have grown exponentially, and it is now one of the most influential and trusted brands in the space. After many years in the recruitment industry, Sheba Karamat decided it was time for something different. She wanted to create a brand-new publishing brand centred around the global blockchain and cryptocurrency space. It was a bold and ambitious idea. So after our successful working relationship with her previous firm, Opilio, her first call was to DWH to help her to come up with the brand. We had our initial meeting to discuss the idea and we collaborated with her throughout the entire process. From brainstorming names to discussing colour palettes, we were only ever a phone call away. Once we had settled on the name ‘Coin Rivet’ we began to conceptualise some logos. We came away with two very strong ideas, but we eventually settled on the ‘Coin’ monogram with an ‘R’ riveted into the icon like a coin. The icon itself is a delicate balance between having a recognisable coin shape while clearly making it stand out as a unique identifier for the business. We then experimented with the word mark and quickly realised that amalgamating the coin icon as part of the word ‘Coin’ created a much stronger brand overall. We then made variations on colour palettes before settling on the turquoise and dark blue. However, instead of dismissing the other colour variants entirely, we created a system that allowed these other colours to be used as part of an overall visual language that could be rolled out as secondary colours, call to action accent colours, and as background colours for any and all graphics. For the initial launch campaign during the summer of 2018, a Squarespace website was created, along with rolling out the brand on graphics for articles, guides and social media campaigns. 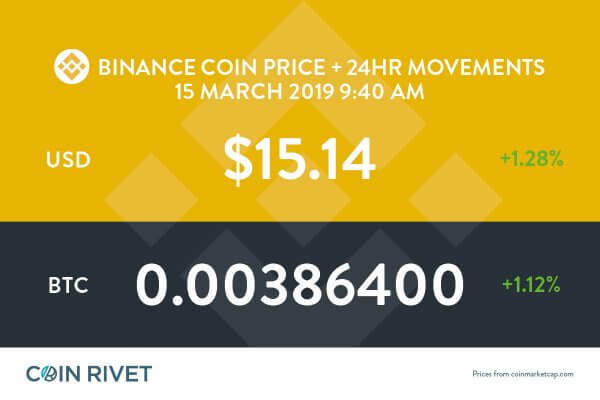 Over time, we would support Coin Rivet in some major campaign rollouts, including the ‘Women in Blockchain’ campaign, the ‘Free Bitcoin’ launch competition, and later on a new campaign for a crypto broker portal. Once the initial launch phase was up and running, we did some extensive work on creating a user interface toolkit for a new WordPress website. 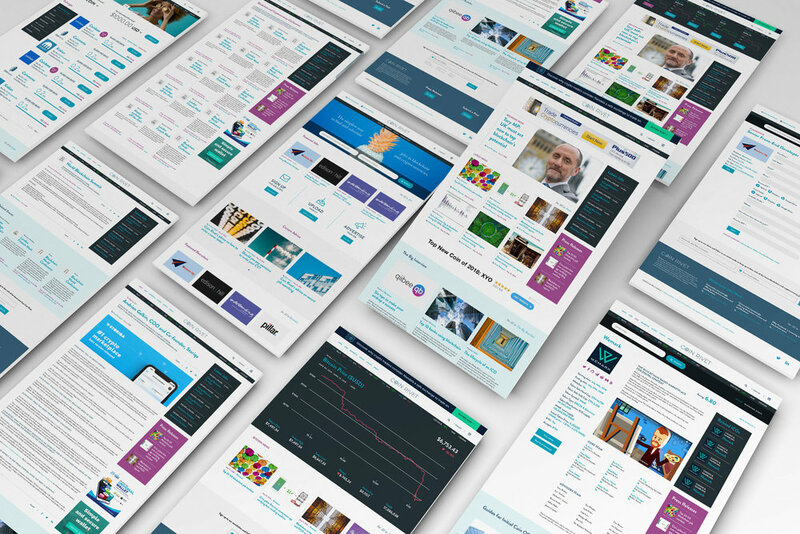 We worked closely with their in-house WordPress developer and UX experts to create an initial visual layout for the top level elements of the website, as well as visualising widgets for the toolkit to be rolled out independently later on. This included sidebars, campaign ads, cryptocurrency market charts and job search functionality. 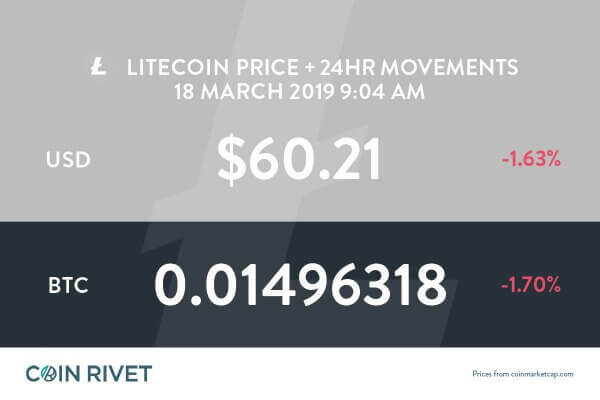 As the business grew, we quickly realised that the extremely volatile nature of cryptocurrency price fluctuations meant that the crypto experts needed a solution to be able to visually report on these fluctuations on a daily (sometimes hourly) basis. We designed and developed a series of infographics that covered the top 10 cryptocurrencies, including individual graphics for each currency that tracked prices against the US dollar and the current market price of Bitcoin. Each of these graphics is linked to an external Excel file that can be easily edited by the crypto experts, which automatically updates the graphics. As each graphic is saved and exported, it updates the graphic with the current date and time. This makes the process of creating up-to-date infographics for the website and social media simple and easy for the in-house experts. As the business grew, it began to offer subscription-based services including video content and premium guides. The content proved so popular that they decided to launch the Coin Rivet Institute. The Institute is a membership and networking group to connect anyone and everyone interested in the blockchain and crypto space. As well as connecting industry professionals, they promote learning and education via the Academy, the creation and sharing of knowledge through our Research, and the sharing of job opportunities and job resources via their Work zone. 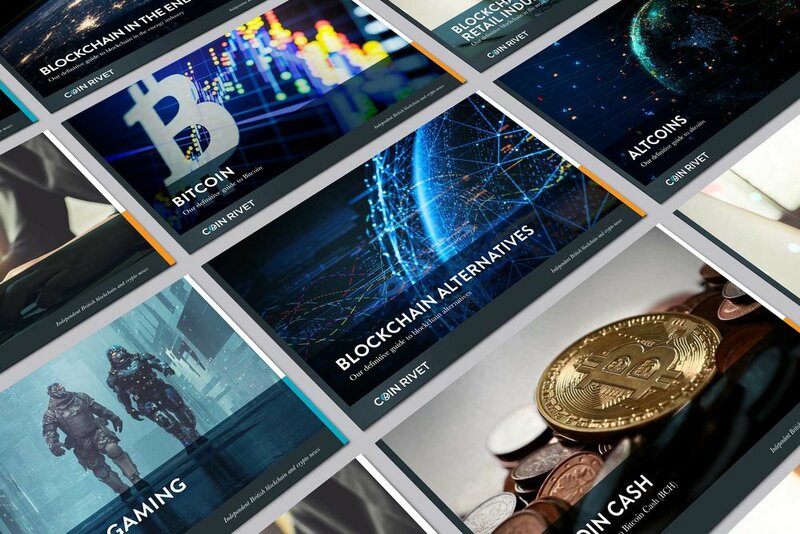 For the launch of the Academy, we were approached to design a series of interactive cryptocurrency and blockchain guides. After creating an initial look and feel for the first guide, we were given a brief for the rest of the guides at the beginning of February. The launch of the Academy was scheduled for February 28th, so the challenge we faced was to design and deliver 30 guides in 28 days. 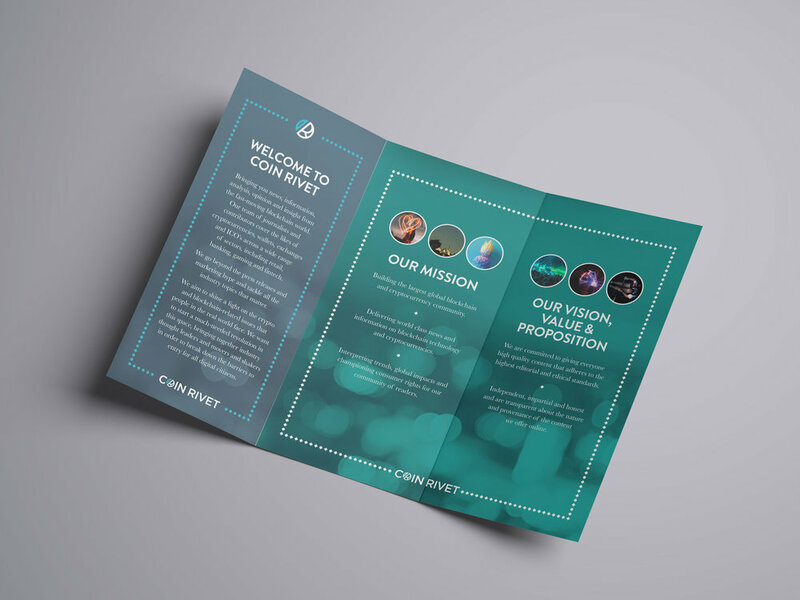 Our design team worked closely with the editorial team at Coin Rivet on a production timetable so we were able to turn these guides around as quickly as possible. Sure enough, we delivered all 30 fully interactive guides the day before the launch of the Academy, and they are now available to download for subscribers. As well as their online presence, Coin Rivet also attend a lot of cryptocurrency events and blockchain summits across the globe. We have supported them with a range of printed deliverables, sometimes to very tight deadlines, including leaflets, direct mailers, bespoke die-cut competition flyers, coasters, VIP cards, pop-up displays and banner stands. We have recently completed a range of collateral for an event in Rio that needed to be printed in English, Portuguese and Spanish! With plenty of new products and services to come, we will continue to help shape and develop the brand digitally and in print. If you’re inspired by this success story, get in contact today to see how we can help you. "DWH have done an amazing job for us. I was very impressed with David and his team. They understood what we needed from the get go. No hassle, no back and forth, no annoying questions. They just knew what we wanted from day one. We have consistently used David and his team for all our global creative campaigns. Their input has been invaluable and I cannot recommend them enough.